Every year the Nativity display and Christmas tree speak to us with their symbolic language. They make more visible what we grasp in the experience of the birth of the Son of God. They are the signs of the compassion of the heavenly Father, of His participation and closeness to humanity, which experiences not abandonment in the night of time, but is instead visited and accompanied in its difficulties. The tree points upwards and inspires us to reach towards “the greater gifts” (cf. 1 Cor 12: 31), to rise above the fog that obscures, to experience how beautiful and joyful it is to be immersed in the light of Christ. In the simplicity of the Nativity display we encounter and contemplate God’s tenderness, made manifest in that of the Child Jesus. This year’s Nativity display, produced as a typical expression of Neapolitan art, is inspired by the works of mercy. They remind us that the Lord said to us: “So whatever you wish that others would do to you, do also to them” (Mt 7: 12). The Nativity display is the evocative place where we contemplate Jesus Who, taking on Himself the miseries of mankind, invites us to do likewise, through acts of mercy. The tree, from Poland this year, is a sign of the faith of the people who, with this gesture too, wished to express their fidelity to the See of Peter. Dear children, my thanks are addressed above all to you. In your works, you have transferred your dreams and your desires to rise to heaven and to be known to Jesus, Who made Himself a child like you to tell you that He loves you. 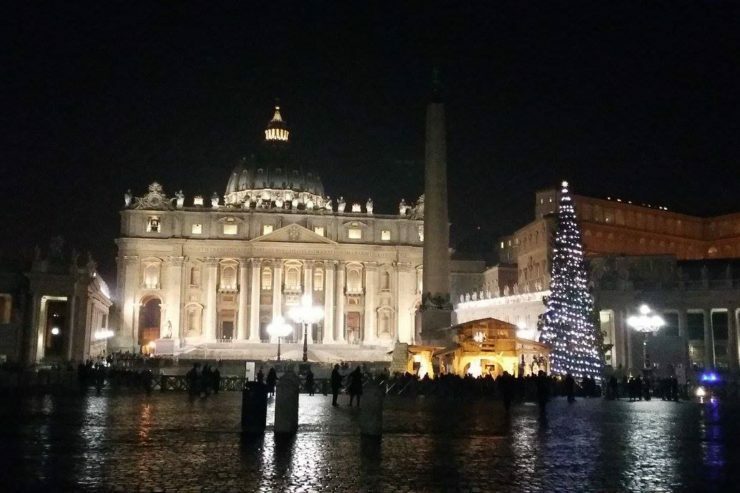 Thank you for your witness, for having made more beautiful these signs of Christmas, that pilgrims and visitors from all over the world will be able to admire. Thank you! Thank you! This evening, when the lights of the Nativity display and the Christmas tree are switched on, the wishes you transferred to your work in decorating the tree will also be luminous and seen by all. Thank you! May the Nativity of the Lord be the opportunity to be more attentive to the needs of the poor and of those who, like Jesus, do not find anyone to welcome them. To you present here, to your loved ones and those you represent, I heartily wish a happy Christmas. I assure you of my prayers so that the Lord may welcome you and fulfill your expectations. I ask you too to pray for me and for my service to the Church. And I will give my blessing to you all, but first let us all pray to Our Lady, together.